The griffin, is a legendary creature with the body of a lion and the head and wings of an eagle. As the lion was traditionally considered the king of the beasts and the eagle the king of the birds, the griffin was thought to be an especially powerful and majestic creature. In antiquity it was a symbol of divine power and a guardian of the divine. 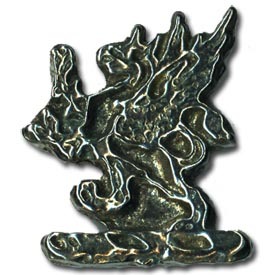 This pin represents a heraldic griffin atop the wreath which would have sat upon a knight's helmet in a depiction of a coat of arms. Pewter, measures 1.25" x 1". Made in USA.